Are you a parent or caregiver of a child aged 9 - 13? Join us for coffee, snacks, and conversation about all things parenting! Location: Carmine Stefano Community Centre, 3100 Weston Road. Have Fun & Learn at our After School Program! We have games and crafts, sports-based activities, nutritional snacks, and educational workshops for children between the ages of 9 and 13! Are you a student at Northview Heights Secondary School? *Contact Joy for details about eligibility for Food Handling Training. We are pleased to invite you to participate in Once Upon A Refugee - a community education event celebrating the experience and contributions of refugees, hosted by North York Community House. In recognition of Refugee Awareness Month, North York Community House will present an interactive, multi-media presentation on Wednesday, April 24th, 2019, from 6:00 to 9:00 p.m., at York Woods Library Theater, 1785 Finch Ave W, North York. This second annual event follows on our highly successful Once Upon a Refugee celebration held last April and will include theatrical presentations, music and dance by refugees to Canada, digital stories, and refreshments. As a community organization that works extensively with refugees, we believe it is important to play an active role in highlighting the challenges that refugees have faced as well as the strengths, accomplishments, and contributions of refugees in Canada. Refreshments will be served from 6:00 - 6:45 pm. The program will begin at 6:45 pm. Childcare is available for children between the ages of 2 - 12 years. Please contact Maxine at MMcKoy@nych.ca to register for childcare. We offer employment readiness, financial literacy and life skills for newcomer men. Support in your job search including developing a cover letter, resume and job interview skills, etc. Share your Skills & Expertise with Newcomers! Volunteer mentors provide support to Internationally Trained Professionals around Canadian Workplace Culture and the Labour Market. 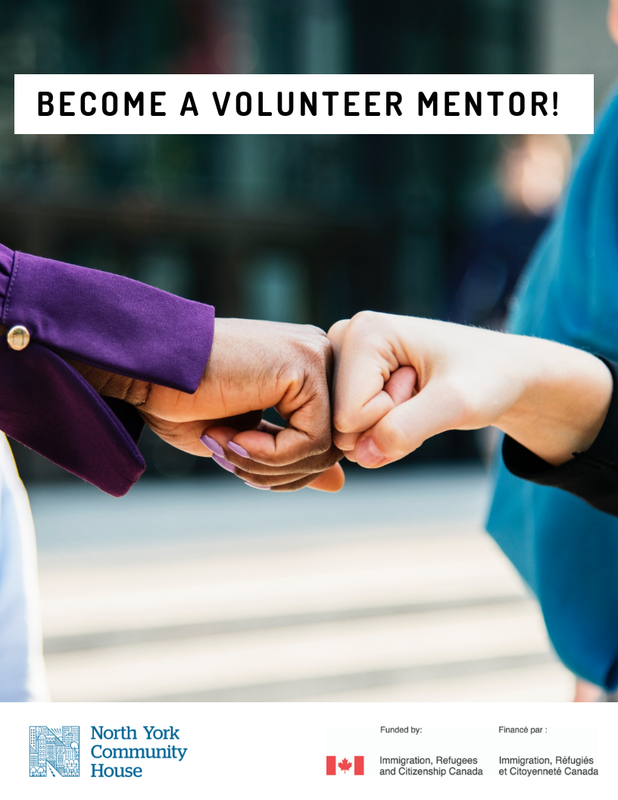 The Mentorship Program matches volunteers from specific industries with newcomers looking for employment in the same (or similar) industry.